The Empress walks downstairs, followed by two pages. Everybody bows. Begone, peasants! Take French leave! Everybody exits. Groucho turns to footmen. Josephine Napoleon, did you hurt yourself? You told me you would be in Egypt tonight. You promised me the Pyramids and Sphinx. Napoleon That remains to be seen, but where are my faithful advisers, Fran�ois, Alphonse and Gaston? Josephine, the whole thing Sphinx. Napoleon Of course I do. They are always wrong. Let me think. Groucho poses with hand in coat and takes snuff. Ah! I love to sniff snuff. Josephine How often have I asked you not to use that horrible snuff? Napoleon This devotion to me is touching, but it's not touching me. I must be quarantined - irritating - fills me with schmerkase. Harpo heads straight for the Empress. Napoleon Well, they are all taking the detour. Over there, Gas! Emperor of the world, what is there left for me to conquer? Alphonse Go to the North Pole - Africa. Fran�ois Go to the end of the world. Napoleon What, Napoleon in Russia, and leave my Josephine alone with the Court? Josephine Napoleon, how can you doubt my love? Napoleon There is a lot of heavy lipping going on around here, but somehow or other I got shoved out of it. Forgive me, my Queen. I don't doubt your love. When I look into your big blue eyes, I know that you are true to the Army. I only hope it remains a standing Army. Fortunately France has no Navy, but then every man has qualms. Even an Emperor. Napoleon But I must not tarry. I must be off. Josephine, if I leave you here with these three snakes - chiselers - I must be off. I must be off to make Russia safe for sinus trouble. To make Russia safe for the five-year plan. That's how I bought this furniture. Napoleon Yes, and the last time I came home all France was with you, and a slice of Italy too. Josephine Napoleon, fight as you never fought before. Don't forget your flannels. Napoleon I shall not fire until I see the whites of their eggs, and you can lay to that. There's a good yolk, Josephine, when one wears flannels, one can't forget. Alphonse . . . Fran�ois . . . well, it's still breathing. He took a crack at it. I'll leave my Josephine in your arms. My honor is safe. Harpo does baseball slide onto dress. Napoleon If you are going to get on, I'm going to get off. Get me a reservation for tomorrow night. It is like a free lunch counter. Three jolly wouldpeckers. Can you play . . . (to Harpo) Hey, wait until I'm through. Hereafter, gentlemen, the line forms on the right. Farewell, my Queen. Beyond the Alps lies more Alps, and the Lord 'Alps those that 'Alps themselves. Vive la France! Music. Groucho exits to the left. AlphonseDarling, I'll be right back. Zeppo exits to the left. Fran�ois Josie, I'll be hump back or half back. Chico exits to the left. Harpo does some business with the Empress before exiting to the left. Alphonse Why are you crying? Alphonse I thought Napoleon was never going. Josephine Are you sure he has gone? Alphonse Yes, he just kissed me goodbye. Josephine Alphonse! Hide! Someone is coming. Napoleon Ten seconds I've been gone, and she is still vertical, and no one is here. Ah! She loves me. Isn't she beautiful? Business of dancing. The footmen enter. Napoleon Get me a bologna sandwich. Never mind the bologna. Never mind the bread. Just bring the check. Get me a wine brick. Napoleon How stupid of you. Why didn't you tell me? Look at that point. I wish you wouldn't open sardines with my sword. I am beginning to smell like a delicatessen. My infantry is beginning to smell like the Cavalry. Farewell, my Queen, farewell. I'm going any minute now, farewell. It's ten cents a dance. I run on the hour and the half hour. Get a load of this footwork. Get me while I'm hot, Josie. Josephine Napoleon, remember, I expect you to return home victorious. Napoleon Our just is cause. We cannot lose. I am fighting for France, Liberty, and those three snakes hiding behind the curtain. Farewell, vis-a-vis Fifi D'Orsay. If my laundry comes, send it general delivery, care of Russia, and count it -- I was a sock short last week. My brassiere was missing too. The last time I had to use my mashie and you might sew on a button hither and yon. Hither is not bad, but yon is terrible. Farewell, my Queen. Vive la France. Music cue and Groucho exits to the left. Fran�ois Josie, has he gone? Fran�ois Anybody. Ah! Josie, you are so beautiful. Fran�ois But, Josie, I am just starting. Josephine But remember, I'm an Empress. Fran�ois Well, you don't Empress me very much. Why don't you marry me? Fran�ois I'll marry him too. He's got money. He's the guy I'm really after. Fran�ois Yes, and it's bigamy too. Chico plays the piano. There's a knock on the door, Groucho enters and Chico hides. Napoleon I passed a groundhog coming in here, Farewell, my Queen, farewell. Josephine Napoleon, now what's wrong? Napoleon I lost my sword. I had a swell chance to stab one of those Russians. It was right near the gates of Moscow. If I find my sword, I Moscow and get him. He promised to wait, but you can't depend on those Greasers. He was a Russian Serf. It Serfs me right. I'm sorry now Lincoln freed the Serfs, if that's the way they're going to act. I am getting disgusted with the whole war. If it rains tomorrow, I think I'll stay in bed. What are your plans, babe? The only thing that keeps me going is your devotion; it keeps me coming back too, I guess. It's women like you that make men like me like women like you. I guess I said something that time. Jo, you're as true as a three-dollar cornet, and believe me, that's nothing to blow about, and if you don't like it, you can trumpet. Where's my sword? Without my sword I'm a second lieutenant -- letter carrier. I'm always holding the bag. I'll be an elevator starter by the time you get through with me. Ah! There's my sword. I wish you wouldn't open sardines with my sword. Oh, no, we had that, didn't we? Looks like I'm off again. The Russians are in full retreat, and I'm right in front of them. Josephine Ah! Darling, when you're away at night, I do nothing but toss and turn. Napoleon I don't mind the turning, but cut out the tossing. There has been a lot of talk about that lately. Farewell, my Queen. Caesar had his Brutus, Charles the First his Cromwell, and I've got rhythm - last two weeks in August. Josephine Gaston! I thought you were never coming. Won't you please play for me? Harpo plays the piano. When a knock is heard, Harpo sits on couch and the Empress sits on Harpo's lap to hide him. Groucho enters. Napoleon Farewell, my Queen, farewell. One last kiss before I go. 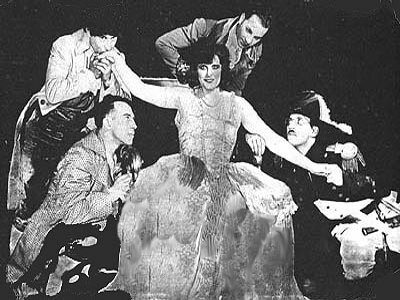 Groucho kneels and kisses Harpo's hand which is around the Empress' waist. My left flank has been turned, my rear end has been cut off but I'll fight it out. Have you been ploughing? Josephine, have you been hanging around a livery stable? I can't figure it out, as great as I am, I can't figure it out. One half of you are getting awfully fresh, certainly having a good time. Harpo puts finger to the Empress' nose. Any answer I give you would seem disrespectful. Josephine Napoleon, dear, I thought you had gone away. More business with hands on couch. Napoleon I guess that's what Studebaker means by free feeling. I was detained. My horse overslept. My horse had his valves ground. When a fella needs a friend. I lost my sword and rubbers. I was in the midst of furious fighting. You're going to need a lot of money for gloves this winter. You have more hands than a pinochle deck. Josephine Napoleon, that's a wonderful uniform you are wearing. Napoleon Josephine, you haven't got my horse under there, have you? Have you shifted your ballast, or is it my astigmatism? Where's my sword? Harpo and the Empress point. Josephine, were there three swords? There seems to be a difference of opinion. Ah! There's my sword. Come on, the whole three of you. Where are my rubbers? Harpo puts his feet out from under the Empress' dress. Napoleon Are those your feet? Maybe you better go to war and I'll stay here. You're getting an awful pair of gondolas, Josephine. They must have crossed you with an elephant. You are getting an awful pair of dogs, Josie. Oh! You are breaking them in for me? I wish you wouldn't wear them around the house. You know what happened to Empress Catherine of Russia. Well, she was headstrong and footstrong too, and they had to send for the Court physician. Business of putting on rubbers. Ah! Ah! Not tonight, Josephine. They certainly feel good, all right. I don't know who is wearing them, but they certainly feel good. Josephine, what are they playing? That old Southern melody...The Marseillaise in the Cold Cold Ground...The Lucky Strike Hour. Vive la France. Music is played, Groucho exits to the left but immediately returns. I forgot to forget my sword. Josephine Oh, dear. I feel so faint. I must have music, sweet music. The harp. The Empress rings bell and a footman enters. Harpo starts to play and the Empress sings. Harpo stops and plays a few chords at the ends of phrases. After the song, Harpo plays solo. At the end of solo, knock is heard. Napoleon (from behind couch) Josephine, it's me, the head man. Napoleon Not yet, what? Josephine, it's me. Josephine I can't see you. Josephine Don't be so fresh. Napoleon I can't help it. I'm wrapped in cellophane. Josephine Fran�ois, will you keep quiet? Do you want Alphonse to hear you? Napoleon Women! Don't try to wool the pull over my eyes. Women! Who's been here? Napoleon Remember, you can fool some of the people all of the time, some of the people all of the time, all of the - oh! The hell with that. I just made that up. Lincoln copped it from me. Someone has been here. Ah! He's a harp. Josephine 'Tis my harp, and I was practicing. Napoleon I don't want you practicing with a harp. That's why I built the English Channel. Deep stuff. Don't you think that your perfidiousness is apparent to me? Do you think you can stand there and make a schlemiel out of Napoleon? Do you think it's fun being Napoleon? How would you like to be Napoleon and stand like this for one hundred and fifty years -- a hundred and sixty? Someone has been here. I'm going to investigate. I'll smoke out these Siberian jackrabbits. Napoleon They say a man's home is his castle. Mine must be the Pennsylvania Station. Come out, come out, wherever you are. Josephine Napoleon, no one has been here, no one is here. Napoleon Why, if I thought there was I'd . . .
What was that -- static? Josephine No, my hay fever. Napoleon How many statics have you got? Officer of the guard, remove the swine. Business of soldiers pulling Groucho. Hey! You've got the wrong swine. If it wasn't so muddy, I'd take off. Come out here. I know you. (to Harpo) Take that off. I know you. Groucho tries to remove sword from sheath. Oh! I can't beat popular mechanics. Harpo spits in sword holder. From Emperor to Cuspidor in two generations. So, my good Queen, while the Emperor has been winning victories on foreign fields, he has been losing on the home ground. So this is how you uphold the honor of the Bonapartes? Zounds on you, you Zanie. Zanes on you, you Zounie. Do you know what I'm going to do to you? Company fall in, right about face, forward march! Script source "The Groucho Phile", Groucho Marx and Hector Arce, 1976.